I always look forward to taking my metal clay show on the road to Pasadena. Every January and July I go to help out Art Clay World USA and teach at the Pasadena Bead and Design Show. The great thing is that students at this venue do not have to bring anything along with them to take a metal clay workshop. 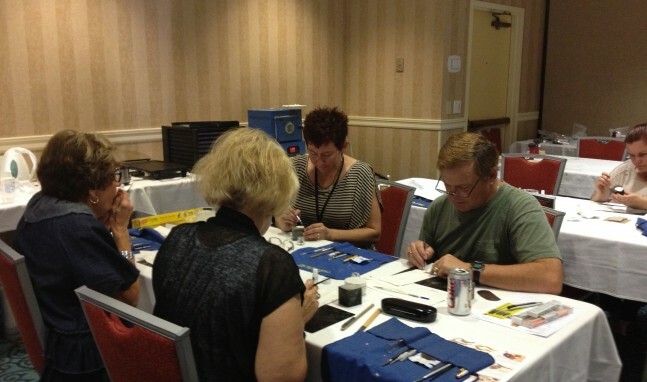 Class fees include the use of tools and supplies, and most classes are appropriate for all skill levels. Metal clay workshops made easy! The Art Clay booth is up front, and the classes take place in the back. This show is really great because of all the variety of vendors, everyone from bead makers to textile artists to yarn makers.